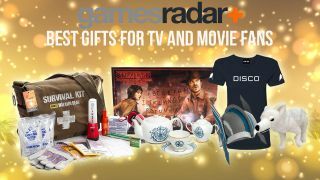 If all you have on your Christmas shopping list right now is socks and selection boxes then worry not, the Christmas elves of GamesRadar are here to help. We've selected the best Christmas gifts for the movie and TV fans in your life,and who - expect your weird hermit uncle Georgia - doesn't love TV and movies? Whether you want to summon the spirits or cuddle up to a giant canine then we have a veritable embarrassment of options for you. And if something were to fall into your shopping basket just for you, then who are we to judge? We're already sipping on Christmas cocktails chilled by the bobbing heads of the Night King. There's cosplay, and then there's stealth cosplay that you can get away with wearing to the office. The minute we saw Lieutenant Commander Michael Burnham rocking her casual clothes, the Discovery's Disco shirt, we knew we had to have one. It's a look that begs the question "am I preparing to battle Klingons or sharing my appreciation for the late 1970's beats of Donna Summer?" Get you a tshirt that can do both. Nothing says Merry Christmas like dabbling with the occult and trying to ask old Nana Ethel's spirit where she hid her stash of valuable ceramic teapots. In a branded twist on the old school board, here the letters are done with the Christmas lights that Joyce Beyers set up in season one. See? Seasonal! We can't guarantee that you'll make contact with anyone from the Upside Down or any other dimension, but it will make a change from your annual family game of Monopoly. If ever there was a sign that the original Harry Potter fandom has grown up, it's when you start seeing branded kitchenware. This is actually a very classy way to show your loyalty to Hogwarts and will elevate your average cup of builder's tea to Downton Abbey levels of fancy. The set includes 12 pieces, including a sugar bowl to keep things sweet and teacup for each house. You've already started wearing your Ikea rug around your shoulders, so why not take your Jon Snow role-playing to the next level with your very own direwolf? We can't promise this one will rip out the throats of your mortal enemies, but then the poop scoop situation is much easier with a plush version. Seriously, those direwolf are big, you'd probably need a trash bag and a shovel. Winter is coming, and it's bring delicious festive cocktails! Whenever the Night King throws a party he generously dips a finger in the drinks of guest to make sure they stay ice cold. If you're unlikely to be invited to one of his legendary parties you can still give friends and family a close experience with the bobbing, dismembered head of our favorite abomination rendered in ice. All the cooling properties, none of the aftertaste of decaying brain matter. The world's a pretty crazy place right now, and frankly a zombie outbreak wouldn't even be the most surprising thing to see on the morning news. That's why it's best to be prepared, and if you haven't made a start on converting on old prison or digging a bunker then a good go-bag is an essential. This AMC approved pack includes Datrex 2400 Calorie Emergency Food Rations, emergency water, first aid supplies and glowsticks. Sadly there aren't any weapons for zombie slaying, so you'll need to remember to pack your own. Basically everything a true The Walking Dead fan needs to know, it goes beyond trivia and plotlines and into the impact the series has had on popular culture and why a story about the undead resonates so well in this troubled times. Written by the Wall Street Journal’s Walking Dead columnist Paul Viga this is a killer piece of reading for anyone who knows their Mika from their Merle. Just because you're too young to legally drink mead doesn't mean you can't experiment with the latest in Asgardian athleisure wear. Make your favorite child the hero of the playground with this knitted tribute to Thor, just be sure to warn them it won't actually protect them from swords, arrows or rampaging Hulks. And if you're an adult with a small head and a thing for helmets then, well, we're not judging. Burn that manky old Christmas jigsaw and give a loved one something legitimately cool to do on Boxing Day. There are an intimidating 1628 pieces to this recreation of the scariest, and leakiest, mental health facility in Gotham so you'll need all your finely tuned skills - and possibly an understanding butler - to get this done without flipping out. It's worth the effort though, especially once you get it done and can admire your favorite Batman villains - in adorable orange prison wear - locked inside your creation. Don't even try fighting the Porg phenomena, just let it take you into its warm, fluffy embrace. Star Wars: The Last Jedi gave us this new cuddly creature, a little nugget that's so adorable it makes Ewoks look like trash pandas with mange. This porg even waddles, flaps and chatters, so you can pretend it's telling you what an absolutely aces Jedi warrior you are and how the glow from your lightsaber has a totally slimming effect on your post-Christmas pudding face. If badass bandit Armistice is your favorite character in Westworld then 1) you have excellent taste and b) you're probably in love with her snake tattoo. Now you can give the give of a full body inking, minus the pain, to yourself or a loved one with this temporary tattoo. In the interest of full disclosure whoever you're going to give it to will need some help applying it, plus around two hours of free time, so maybe don't use it for your office's Secret Santa. This is a safe, healthy way to share with the Game Of Thrones author exactly what you think of the way he killed off [redacted], or decided to have [redacted] and [redacted] get together, or perhaps even release some frustration about that whole last book in the series situation. It comes with ten actual phrases from the man himself, including a Red Wedding joke (too soon) and an exasperated "I'm working on it!" Two female icons combine to bring you this plastic tribute to 2017's biggest hero. She comes with her regulation headdress, boots, armored bracelets, lasso, sword, shield and black cape, and is ready to protect and defend your desk, shelves or Barbie Dream House. Or you can keep her entombed in the box like a monster and consider it an investment for the future. If you're feeling flush you can always spring for the Queen Hippolyta too, in the name of sisterhood. Give a gift of movie magic that lasts all year round with a subscription to Total Film. The best previews, features, interviews and all the hottest news about the blockbusters, the indies, and everything in between. Lovingly crafted by a team of movie experts with impeccable taste, it'll make you a popular person on Christmas morning and every single month after.